My children have grown up hearing stories of their parents' travels in far off and exotic places. Sailing in Greece, fending off monkeys in India, riding elephants in Thailand; these and more have filled their childhood dreams. 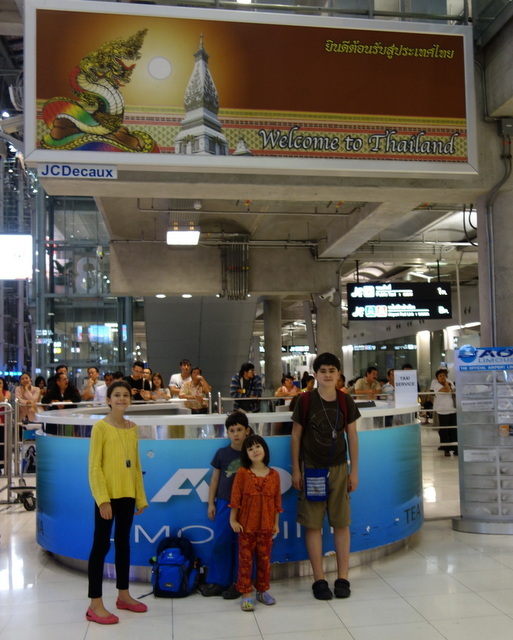 We've given them as many of their own travel experiences as we've been able, and when we came upon a super deal on tickets to Thailand this fall, we decided it was time to take a little journey! The last several weeks have been filled with logistical planning, passport renewal, trying to keep everyone healthy, learning about rice farming and silk production, elephants, Thai culture and more. Finally on Wednesday, the big day arrived, and ready or not, we headed to our little local airport. Excitement ran high, knowing we were off on a long awaited adventure. I was reminded again of a saying in my family that was something like, "The journey is part of the trip." Years ago, after a very long travel day, we arrived at our family's home in Mexico where I happened upon a journal written by my adventuring great grandfather. On its cover was a quote that read, "It is a pleasant journey in which the trip is part of the destination." Getting there is often not the most exciting or memorable part of a trip, but it can certainly be an adventure! Join us on our journey to Thailand. 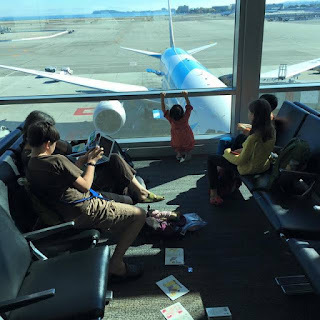 We started out with a short flight from Eugene to San Jose, California. Pearl was pretty pleased to get Daddy all to herself! Upon arrival in San Jose, we rented a van and stopped in to see my dear friend Christy and her lovely girls. Christy and I lived and traveled together in Asia for the better part of a year a long time ago. Christy's family is walking through a dark valley as her husband battles leukemia, and our visit, while short, was a wonderful time of connection and love. 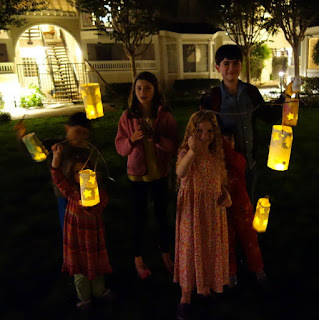 She and the girls had made lanterns for a St. Martin's Day lantern walk, and the children carried their lights, ran and played in the dark evening. We all enjoyed a wonderful meal that Christy had prepared, and ended our sweet time together with hugs and prayers. It was a wonderful start to our trip! We spent the night at a hotel near the San Franciso airport, where we would be flying from the next day. The children all settled down well, but Erik and I lay there all night, tossing and turning and not sleeping. The longer I lay there, the more anxious I became, knowing that we were about to embark on a very long and tiring journey and that I was starting out completely exhausted. I tried to fill my mind with truth and reject the fear that was creeping in. I spent time praying, trying to breathe in peace and let go of the anxious thoughts that seemed to fill my mind. Morning arrived and I felt physically sick from lack of sleep. We had at least 24 hours of travel before we would see another bed, and I felt entirely unprepared after a long, sleepless night. Ready or not, we made our way to the airport and got checked in. 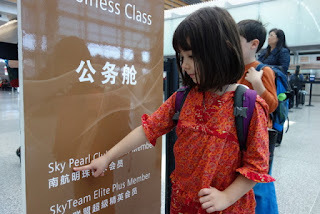 Our first flight was to Wuhan, China, and would be nearly 14 hours long! 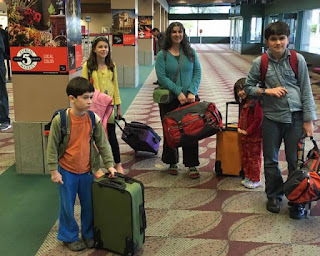 This is the first time we've flown so far away with the kids. We had quite a bit of time to wait in the airport before boarding. So much of life, and travel, is waiting! 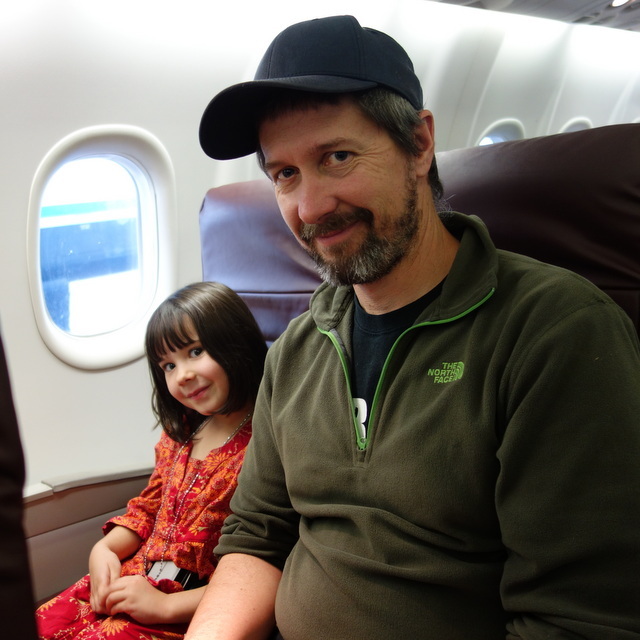 On our flight at last, we settled into our seats. The kids haven't ever been on such a big airplane. They were most excited about the personal entertainment centers in the back of each seat, which had a large selection of movies and games they could play. Also, hot meals! And steaming face cloths! And blankets and pillows! It was all quite exciting, for a few hours at least. We flew up along the west coast and over Alaska, across Russia, and over China. We were in daylight for most of the time, except for a little while over Alaska, and then the sun set over China shortly before we landed. It was fun to watch the progress of the plane on the monitors. We had to collect our checked bags and go through customs in China, and had a little over three hours there before our next flight. 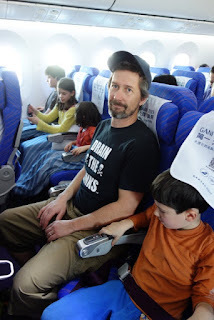 Most of the kid and I had gotten a little sleep on the first flight, but we were all pretty sleepy by this time. I decided that next time I need a new passport, I should stay awake for about 40 hours before I get my photo taken, as the Chinese authorities didn't seem at all certain it was me. 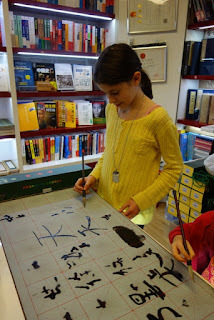 They kept looking at me, then the passport, then conferring with one another, then having me write my name, then sign my name. Finally they decided I could go through! Peregrine lay down on the floor, and then across some chairs, and slept for a while. The girls and I popped into a book shop where they got to play with a fun calligraphy set. There were some Chinese tour groups, and the women were absolutely taken with Pearl. They kept coming over and taking pictures of her with their cell phones. I also forgot how in Asia, it's totally okay to stare at people! There is actually something kind of refreshing about that. 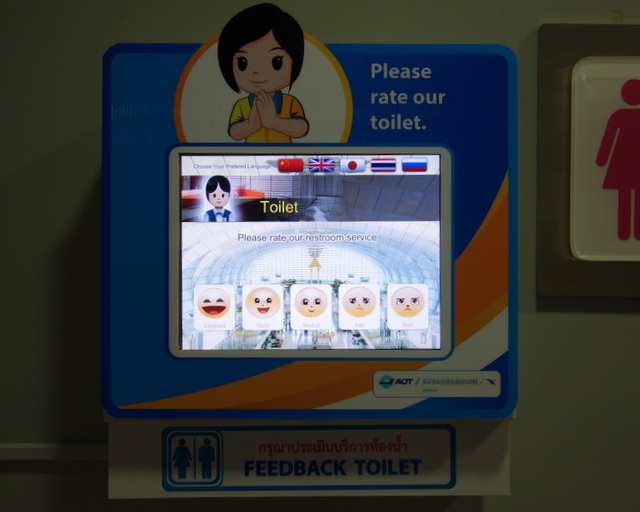 And here is the Feedback Toilet, where you can rate your toilet experience! Considering there were squatty potties, which I'm quite fond of, and western toilets for people who prefer them, and toilet paper, which is not a given in this part of the world, and we didn't have to pay to use the toilet, and it was all quite clean, we gave it a good review! The flight from Wuhan, China to Bangkok was a little over three hours. We were, as you can imagine, good and tired by the time we arrived! 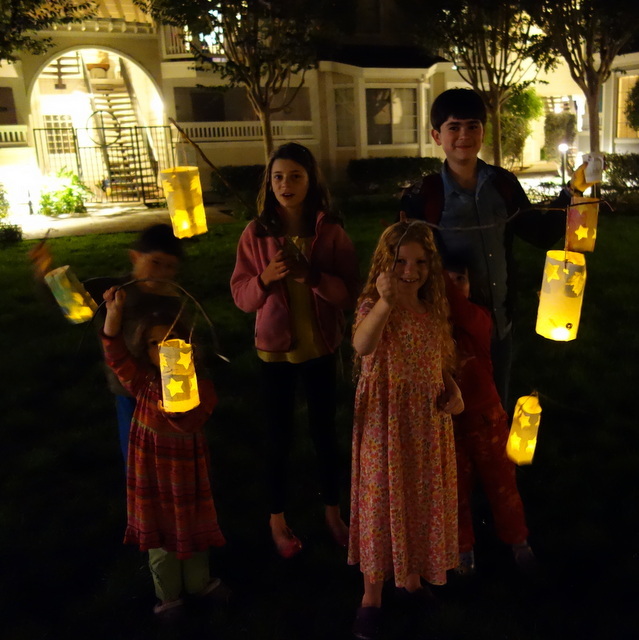 I was so proud of how well the kids had done throughout a very long day. We happily collected our bags and breezed through customs. We had to wait a while for the shuttle to our hotel, and finally exited the airport into a steamy Bangkok night. It was after two in the morning here, fifteen hours ahead of Pacific Standard time. But after so many long hours of traveling and a sleepless night to start it all off, we were definitely ready for a quick shower and some sleep. We couldn't know it then, but the next day, our hourlong flight north to Chiang Mai would prove to be an adventure of its own. Sneak preview... there will be Bangkok traffic, and geckos, and sprinting through an airport, and passports that traveled to Singapore without us!